A question that often comes up when people discuss the subject of mobile apps is measurement – What matters in the world of App Analytics? Do I need to measure my mobile app usage, or shall I just focus on increasing number of downloads? The ultimate goal. At Bango we have learned that the developers and brands that most effectively market their apps in an already overcrowded market, have a detailed understanding of how customers are interacting with their apps. Measurement is at the heart of mobile performance and the insights provided by detailed user analytics determine the difference between success and failure. Here in our interview with Anil Malhotra, Co-Founder and SVP Marketing and Alliances, at Bango, we get his view on how application analytics provide the answers that developers need. We find out in detail why application analytics does matter and why it should be an essential tool for all developers. Application analytics – Just for measuring downloads? Until recently, many developers weren’t aware or, rather, were simply confused about why and how to measure their mobile app performance. With many using app stores to distribute, the options for using analytics were limited. App store restrictions on the use of third-party analytics tools along with their limited ability to provide accurate information, has limited the critical insights that enable publishers to quickly evolve their apps. A report on the number of downloads is an indicator of how successful the app is, but says nothing about how engaged customers are, how to increase sales, how successful the marketing programs are. If you flip the coin and imagine providing all of these insights, in real-time, now you are looking at a powerful platform for success. This way you’ll be able to optimize your apps and provide the mobile experience that customers expect. After all, engaged customers means more sales. What are the key metrics that application analytics deliver? In addition to core metrics, such as how many people have downloaded the app, the operator and country where the apps is being used, a good app analytics solutions should provide deep insights into how customers are interacting with the app. In the case of Bango application analytics, we provide a 360 degree view of in-app activity, where developers get accurate information about how users are using the apps, the session length, what gets used, the usage sequence, what sections and features of the apps are more popular and so on. Also, uniquely to Bango, we deliver powerful real-time reporting, including multi-dimensional reports with filtering for in-depth analysis. This allows developers to see their app-activity as it happens, so they can optimize their apps accordingly. At Bango we give publishers control over their apps, so another important feature of our solution is that the developer owns the data. The offer to provide ‘free’ app analytics is usually a poor deal, it means that the business model for the analytics provider is usually in selling the data to advertisers or other third parties. This is a crucial factor, as data ownership continues to be a grey area and touches on privacy and ‘right to use’ issues. What is different about Bango application analytics? Bango Application Analytics we’ve majored in three areas of fundamental importance: accuracy, insights and performance. Let me detail these in reverse order. We’ve spent a lot of time reducing the load on the apps that use our analytics. You can determine what events you want to capture in real-time and push this straight out into your on-line reporting tools. Or for event rich apps, you can batch the records and push them out when the data transfer will not impact app performance. We’ve worked very hard on providing real-time reporting. For businesses where live adjustment of ad spend or usage stats matters, real-time reporting is essential. In terms of insights, we continue to develop more variations on filters and reporting views in the toolset. We’re fortunate to have some of the biggest app publishers in the world using Bango Analytics – broadcasters, publishers, entertainment businesses, enterprise customers. Their input has driven the development of the kinds of reports that global businesses demand. Now any developer or app publisher can benefit from the results of this work we’ve done for the big brands. We also provide insights across mobile channels. By that I mean mobile web sites, mobile apps, different platforms, plus very sophisticated campaign analytics. And we enable our customers to compare their mobile application usage across every app, channel and platform for a truly aggregated view – what we call the 360 degree view. Now we’re starting to deliver analytics for the publisher-side of the business. This means that a business selling advertising inventory can turn to independently measured data to optimize the value of their inventory. Your first point was accuracy, how accurate is Bango Analytics? Bango achieves the highest accuracy through unique technology that builds an identity profile, capturing data points from the device, browser, network, and o/s leveraging Bango’s long-standing relationships with operators and other mobile partners provide. Independent tests have shown that Bango delivers 8 times greater accuracy identifying mobile visitors than traditional analytics solutions (according to tests by Bryson Meunier, an SEO Consultant at Resolution Media). 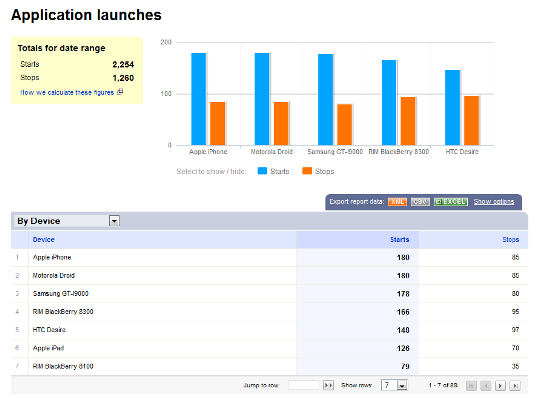 We’ve also recently updated our application analytics solution to provide a SDK that supports BlackBerry, Android and Apple, with more platforms available soon, including Windows phone 7. This has been published open source, allowing developers to use it in their own development and for full platform coverage if they require it. This entry was posted in app analytics and tagged Mobile apps. Bookmark the permalink.